The first time I walked into this kitchen, I swooned. Not because of top-of-the-line updates or gleaming newness (the price tag for those features in Capitol Hill takes us well out of our budget). Rather, it's the space that feels right. There's room to breathe, to move around, to gather, to hang out, to eat. I can't tell you how rare these qualities are in 100+ year old rowhouses. The second time we visited the house, we'd already decided we couldn't live with the basement - we actually just sat at the dining table to write an offer on another house. I couldn't even look into the kitchen, I loved it so much. Walking into that kitchen I was saying goodbye to? Not an option for me. And so I wouldn't leave the dining room. Out of sight, out of mind... or so I thought. But now here we are, basement be damned, and this is my kitchen. I'm beyond excited to make this space mine. One thing I know with certainty after touring dozens and dozens of kitchens over the last several months: I prefer kitchens that aren't updated. Here's why: I don't want to pay for someone else's design choices. 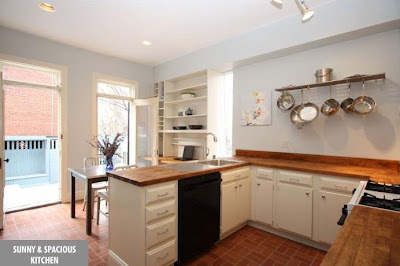 Any kitchen updates dramatically increase the price of the home, and I probably only saw one updated kitchen that I actually liked in all the houses we toured. Having to pay up for someone else's awful cabinets or weird granite, just to rip it out as soon as financially possible? No thanks. 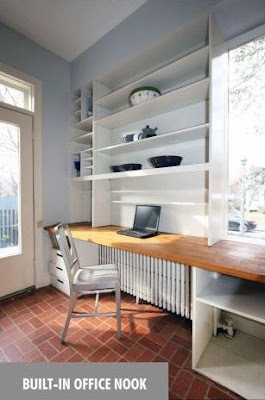 I'd rather find a great space and know that over time, I can update it precisely to my tastes. 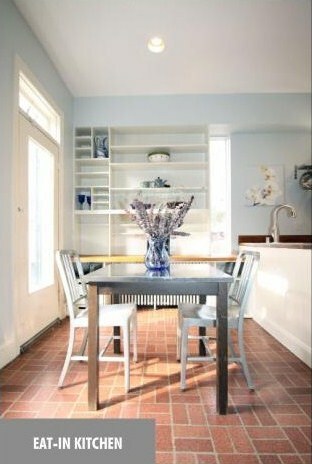 That said, white cabinets with butcher block countertops are my absolute favorite! So some obvious updates: let's start with the floors. These are actually the same floors that are in my parents' kitchen, which makes me smile. But the faux brick laminate won't be around forever. The appliances need updating, too ... although in the meantime, I'm just happy to get back into the world of gas cooking and leave my wretched ceramic-top stove behind. The above photo is taken from the perspective of the refrigerator, which is the oldest appliance, but which also has great cabinet storage above it. Eat-in goodness! I love all this space. We may do something different with the built-ins down the road (I'm dreaming of a banquette on one side), but for now, a fresh coat of white paint and I'm filling these babies up (how great will my flame Le Creuset collection look here?!). I love that I can easily work down here if I get sick of my office, too. Are you noticing all the light, by the way? The light is just unstoppable in this house. Pretend there are great pendant lights hanging above the counter in the picture below. Are you picking up what I'm throwing down? A little half-bath is in the nook across from the pantry. Now for the big question: what color am I going to paint the kitchen? I've always had cheery reds and yellows in my kitchen, but the strong light is such a game-changer in this house. This baby blue definitely isn't me, but I'm not sure which direction to take it. I've been playing around with the idea of doing something really different in the kitchen - a decorative ceiling or a graphic back wall, for instance, to add punches of color and interest while also honoring how great white looks in this house. Time will tell! Ideas? Kitchen renovation stories of your own? I'm all ears! Congrats on the house!! It looks like a great space. Can't wait and see what you guys do with it. I love the kitchen! Considering how my kitchen really hasn't been updated since it was built in 1985 (including a yellow/cream/yucky stove), I think your kitchen looks very up-to-date and cheery. What a happy space. Anyway - fun! Can't wait to see what you do! Gorgeous kitchen! 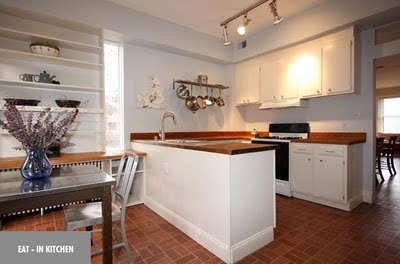 I am so impressed you found a row house with such a large, open-feeling kitchen. So many seem so cramped or dark. I don't know much about decorating, but how about grey for the walls of the kitchen, with lots of bright accents? 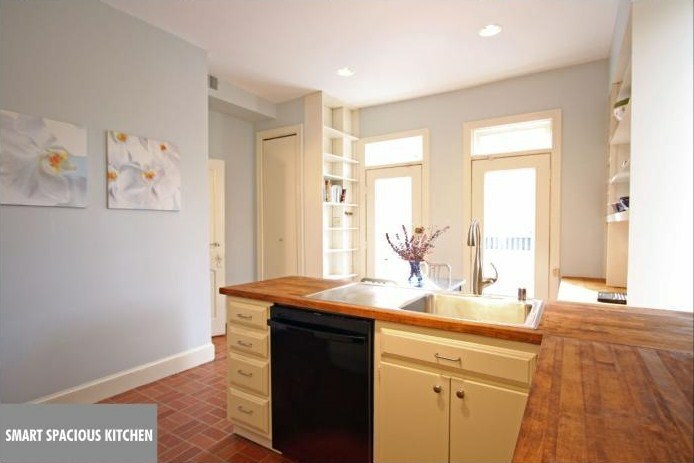 I think with all that light, a bright color might be too glaring, but pastels just don't seem to fit in a kitchen. I'm particularly partial to the grey-orange combo, so I think it would look great with the flame Le Creuset and the white cabinets. Love it. So jealous and so happy for you! an open, eat-in kitchen AND a half bath on the main floor? i hate you. ok more seriously, i love the look of white subway tiles as a black splash (or even along that wall with the pot rack as well) with this color combo. 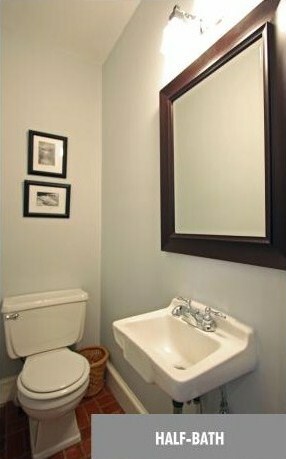 and then a bold wall color elsewhere or as an accent wall? I love this kitchen!! Those countertops are amazing! And I don't even mind the faux brick flooring in the space - it'll look great with your Le Cruset. I immediately thought of painting the entire kitchen a really crisp white. And then use your LeCruset, dining table placemats, kitchen accessories (tea pot, etc.) to add all the color. Orange and white can be really fabulous, especially with so much bright light coming in through the windows! So fun! LOVE IT!! I am with you- give me a kitchen to update any day- I'd much rather make my own choices. When we renovated the condo kitchen, I used Georgian Green by Benjamin Moore, and loved it in a kitchen with white cabinets. My mom painted their living room the same shade, and I'm using it in the guest room next. 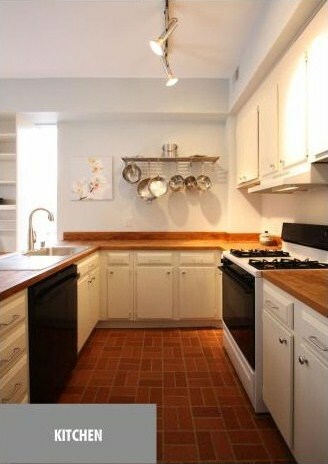 Seriously, that is one wonderful kitchen- I'm just too thrilled for y'all! I love your kitchen. We've been slowly buy surely updating ours (from yellow cabinets -- yuck!). I can't wait to see how you decorate. Those built-ins are amazing! I can definitely imagine some gorgeous pendant lights with large round shades. I'm so excited what you are going to do with the house Maggie! Wow, look at all that counter space!! It's nice to have a space that doesnt need anything major - just some paint and new appliances as needed and you will be good to go. I second the recs for grey and white - my last kitchen was grey and I really liked it - it looked great with my mostly red small appliances and accessories. Light and space is all. I agree with you completely about updates, being picky, I'd much rather do it myself. I find most kitchen updates too ornate for my tastes. And that laminate. Aw. When I moved into the house in which I now live, 25 years ago, I replaced the avocado green laminate with similar faux brick. Cheapest cosmetic fix we could find to counteract avo green and harvest gold. The floor is now hardwood. But I still have the laminate in the laundry room:). In my kitchen now, what I love most are a) My Thermador range with an 18,000 BTUs burner, my Sub-Zero freezer on bottom fridge, and my plain black granite/butcher block counters. The hardwood floors are actually a pain in the neck to keep up. But beautiful, so there's that. It's beautiful! I love the sun light and the built-ins. oh my gosh-- that kitchen! green with envy here. congrats! you've definitely earned it! Wow!!! All that light! I dream of a kitchen with windows in it. Good counter space too! LOVE it! Maggie, I am completely swooning over your pretty new house! Love it. That kitchen is fantastic. And I 100% agree with you on preferring a place that hasn't been completely redone recently. I have said that same thing about not wanting to be stuck with someone's granite selection. I would much rather redo it ourselves. This will be a beautiful space to work on with such a good starting point/foundation! I just came back to check on your house hunt and saw the great news -- congrats and welcome to the neighborhood! The kitchen is absolutely stunning. I agree about the countertops and cabinetry. It's so simple and bright! Love it, love it. Congratulations again! Congratulations! So exciting! You guys have found a lovely gem in a lovely neighborhood. Can't wait to see the transformations. Just catcing up on all the house tours. I LOVE this kitchen! Beautiful layout and so functional. You're gonna love cooking in there. Your kitchen is beautiful! Really really impressed by how nice a job you've done. You should be proud!